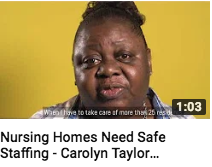 Say NO to Short Staffing in Our Nursing Homes! 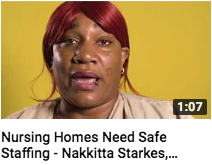 The Problem: Our state’s nursing homes are woefully understaffed! Over the course of an eight-hour shift, direct care givers — nurses and nursing assistants — often single handedly provide care to as many as 25 residents. The Solution: The health care industry needs better regulation to address the quality of care and staffing crisis in Maryland’s nursing homes. 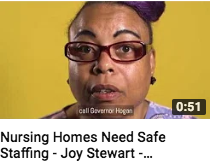 To fight for better care, 1199SEIU advocated for strengthened state regulations that would increase the number of nursing service personnel per resident from 1:25 to 1:15. Watch videos below of members discussing this crisis. Raise YOUR voice and take action today! We need your help today to stand together and say NO to short staffing of direct care givers in our nursing homes. 3. Make your voices heard by sharing this with friends and family so they can act today.